This captivating collection of treasured classics and contemporary adventures is perfect for reading aloud to your family. From bestselling Christian authors such as Max Lucado, Billy Graham, Kay Arthur, and more, these wonderful stories will inspire adults and children alike. 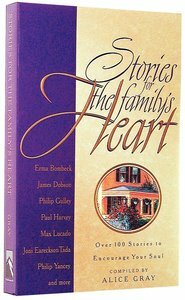 About "Stories For a Family's Heart"
This treasury of family stories continues in the style of two previous bestsellers by Alice Gray, Stories for the Heart and More Stories for the Heart, both featured on Billy Graham's national TV broadcasts. Her tender stories deliver Christian values in a captivating and wondrous way that appeals to parents, grandparents, couples, and single moms. They're ideal for families to read together or for anyone to curl up with on the couch and read alone. Contributors include bestselling authors like Max Lucado, Chuck Swindoll, Billy and Ruth Graham, Tony Campolo, Paul Harvey, Erma Bombeck, and Philip Gulley. Whenever a family needs an emotional or spiritual pick-me-up, this book is the answer. Looking for ways to encourage your family in their faith journey? Perfect for reading aloud at family "story nights," this captivating collection of treasured classics and contemporary adventures from your favorite Christian authors (Max Lucado, Billy Graham, Kay Arthur, and more) will inspire adults and children alike. A sure-fire emotional and spiritual pick-me-up! This rich treasury of stories about family continues in the style of Alice Gray's bestselling "Stories for the Heart" series. Each tender story delivers family values in a captivating and wondrous way that appeals to parents, grandparents, couples and single moms. This rich treasury of stories about family -- continues in the style of Alice Gray's bestselling Stories for the Heart series. Whenever a family needs an emotional or spiritual pick-me-up, this book is the place to start!